1/4 x 8 x 1 in. 4 tapes, each has writing on the front. 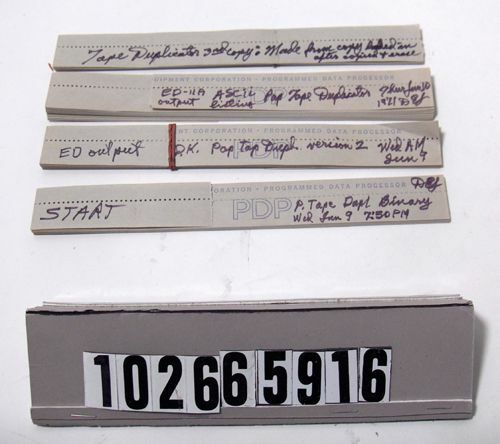 One tape has "START P. Tape Dept Binary Wed jun 9 7:50 PM", next has "ED output D.K. Pop Tap <can't read> version 2 Wed AM Jun 9", next has "ED-11A output ASCII listing Pop Tape Duplicator Thur Jun 10 1971", and the last has "Tape Duplicator 3rd copy: Made from copy loaded in after copied + erase".